An artwork "woke" an invisible mythical giant, leaving footprints on the Denbighshire landscape. 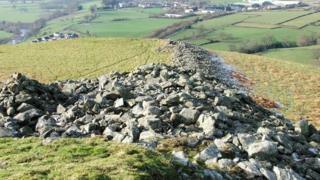 According to folklore, Drewyn was a figure of kindness, with his defining act creating the Caer Drewyn hill fort. This was a gift for his sweetheart, a milk maid, as a place for her to keep her cattle. The story was brought to life in Corwen on Saturday as part of the Year of Discovery, which aims to explore the mythology of giants in Wales. As well as footprints, the event saw the invisible giant drop personal belongings from a hole in his pocket, which included mementoes from his interactions with other giants and his sweetheart. He then fell asleep and left an impression in the ground where he lay. Waking Corwen's Giant was created by artist Gordon Rogers and engineer John Kettles, who said: "Much of the evidence in the landscape that we traditionally attribute to giants is often the result of huge geological energy such as volcanic plugs and glacial erratics. "So our vision for Drewyn was of a being that is made of this energy." The creators explained the idea behind the artwork was that giants "must exist as the stuff they've made is everywhere, so it's obvious that giants are also invisible otherwise we'd see them all the time." Image caption Have giants roamed these landscapes in Denbighshire? Therefore, the only way of knowing one was walking nearby would be their footprints appearing in the ground. The local Area of Outstanding National Beauty's Ceri Lloyd said: "Waking Corwen's Giant is an opportunity to celebrate the myths and legends of the area while bringing a lesser-known local story to the forefront."